I love automotive-themed games I can play with my family. My parents had a collection of old board games in the basement that we’d often break out on weeknights, and a bunch of the titles were automotive-related, like Mille Bornes. If Pressman Toy’s No Exit had been released when I was young, it would probably have been in that collection. It has the feel and look of a classic family game, but is it one I’d share with my kids? Can you escape the labyrinth of winding roads? 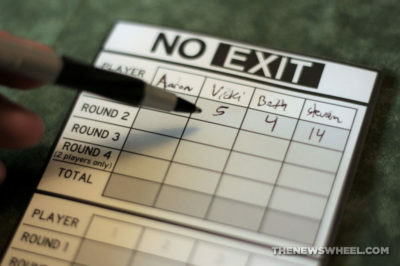 No Exit involves three to four rounds depending on the number of players. In each round, every players gets one opportunity to be the road-builder while the other players are the drivers. The road-builder shuffles the road tiles and flips three of them over, choosing one of them to add to the starting tile already in the middle of the table. The drivers each choose a plastic car and place it by the starting tile. In clockwise order, a driver will roll the die and move that many spaces (one to three), hoping to progress far enough to move off the end of a tile/road and out of the game. 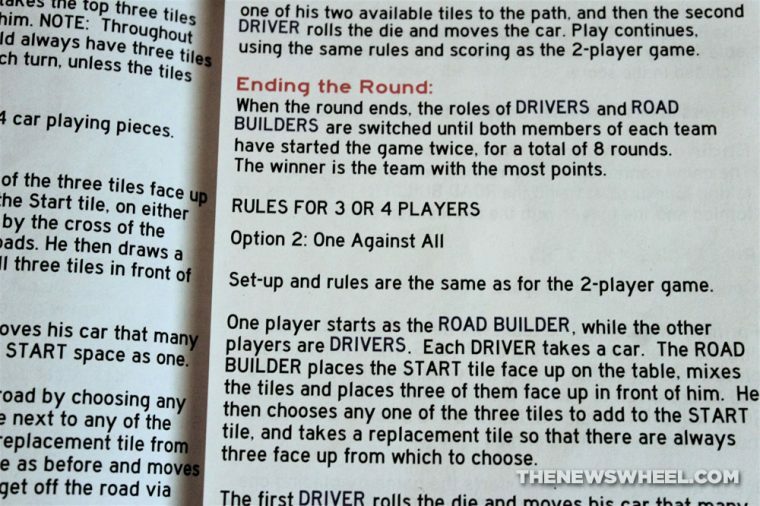 Once a player moves, the road-builder takes his turn and chooses one of the three unused face-up tiles (which replenishes) to add to the network of roads, hoping to extend the road further to keep the players going for longer. Once all drivers have left the road, the turn ends and the road-builder’s score is calculated: However many tiles he played (excluding the start tile) is his score. After all players get the chance to be the road-builder and multiple rounds are played, the person with the highest total score wins. I love the visual design of No Exit. 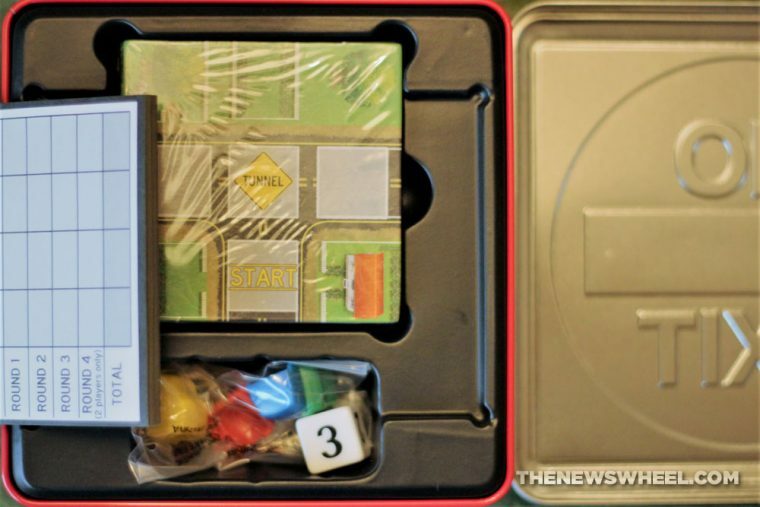 From the first impression of the bold, road sign-like tin container (that boldly professes its automotive inspiration) to the colorful details of the cardboard road tiles, No Exit is an attractive-looking game. Even the cars inside are cute, compact-style family sedans made of high-quality plastic. It’s truly a design that catches the eye and follows through on component design and quality. Are You Protected? What all does a bumper-to-bumper warranty cover? Unfortunately, the same level of care in crafting the components of No Exit didn’t go into writing or printing its instructions. This compact, choppily organized leaflet is entirely text — no visual aids. It offers no example scenarios for clarification and it’s clearly an old version of the rules which aren’t always applicable to the components packaged with it. Luckily, the game isn’t complicated, so you won’t be relying heavily on these directions to learn it. 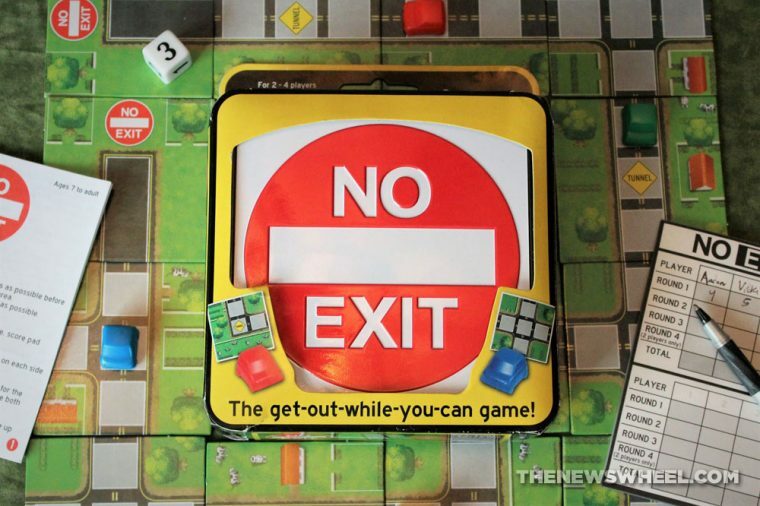 The directions give multiple ways to play No Exit: 1 vs. 1, 2 vs. 2, or 3 vs. 1. Typically, I appreciate the variety of modes to increase play potential and replay value, but here it feels like the designers weren’t sure the best way to play the game, as none of the really work. I love when game designers find ways to merge themes and mechanics in new, refreshing ways. Clearly, the creators of No Exit wanted to make a game that played differently than the abundance of other car-racing board games. They made an experience that feels like an asymmetrical dungeon-crawler: one player is building the labyrinth and everyone else is trying to escape it. That’s a seriously fantastic idea for an automotive game that hasn’t been done before. I love it. Unfortunately, No Exit has a lot of potential as a concept that it doesn’t fulfill in execution. It’s a very broken game that rarely hits the length or challenge that it needs to be enjoyable. 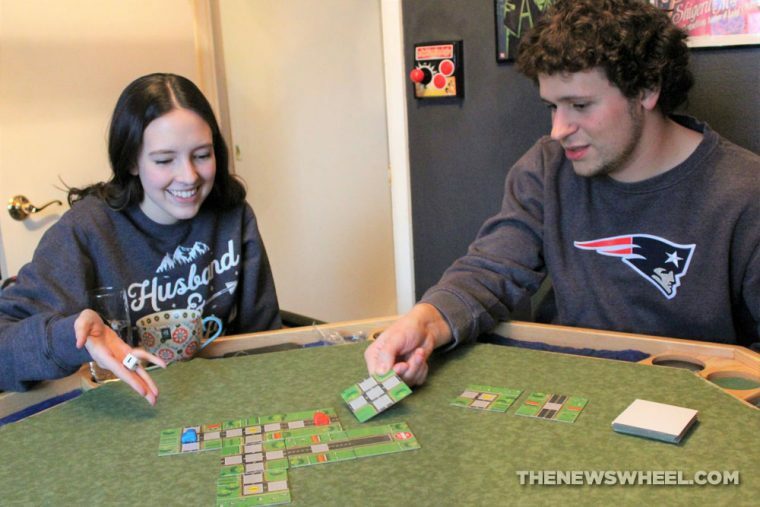 I played No Exit with varying numbers of players — from the minimum two to the maximum four — to try all the variants, but the game never played how it felt like the designers wanted it to. Nearly every time I played, all but one of the drivers exited the board on the first or second round, leaving one player to speed off either quickly after or many, many turns later. In either case, the outcome felt anti-climactic. 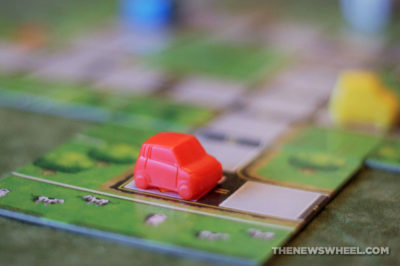 Because no two cars can be on the same space, that can lead to cars hopping off the board almost immediately and not participating in most of the game. For the road-builder, the tiles chosen and where they’re placed hardly matter or have any impact on the outcome. 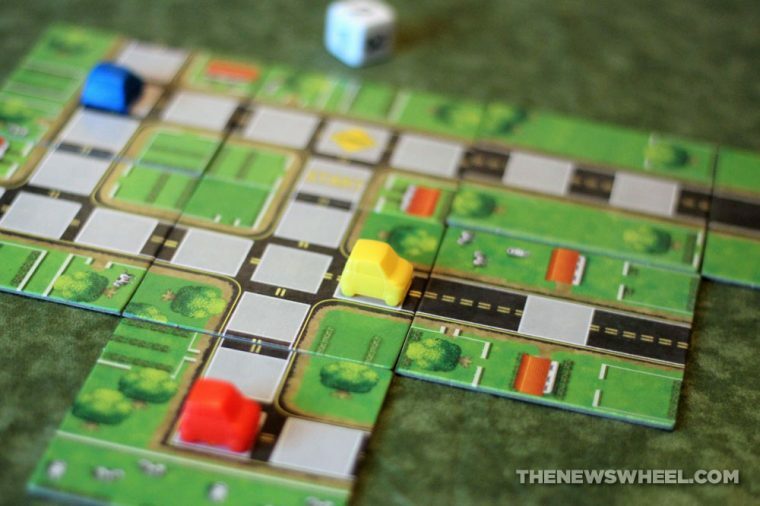 The road-builder should have to plan carefully which tiles he chooses and where to put them to keep all players on the board. But, there’s no balance or strategy to the choices being made. I would love to see No Exit revived some day by a designer who saw the potential in it and knew how to expand the gameplay and deepen the strategy. I think it could be a hit with modern gamers looking for a light strategy game that stood out from other car-racing games. If that ever happens, I’ll be first in line to buy a copy. No Exit is out of print but can still be found on some online marketplaces.